While the 2013 Breeders’ Cup World Championships are in the books, the race for Champion Three-year-old male may end up being decided by two races on Thanksgiving weekend. The Grade 1 Clark Handicap at Churchill Downs, slated for Friday, November 29, could feature leading three-year-old male Will Take Charge, fresh off a second-place finish in the Grade 1 Breeders’ Cup Classic. Should Will Take Charge win the Clark, he is a lock for Champion Three-year-old male. The other contender added to the mix after defeating older horses in the Grade 1 Breeders’ Cup Dirt Mile, is Goldencents, who is set to run in the Grade 1 Cigar Mile at Aqueduct on Saturday, November 30, according to co-owner Glenn Sorgenstein. Goldencents will have to battle it out against Breeders’ Cup Filly and Mare Sprint winner Groupie Doll, who was just purchased for $3.1 million at Keeneland’s November Breeding Stock Sale by Mandy Pope of Whisper Hill Farm. Will Take Charge on the other hand, has only been listed as “possible” for the Clark Handicap, according to Hall of Fame trainer D. Wayne Lukas. Hall of fame-trainer Bob Baffert also listed his multiple Grade 1-winner Game On Dude as “possible” for the Clark Handicap. Game On Dude finished a disappointing ninth sent off as the 6-5 favorite in the Breeders’ Cup Classic. It seems that if Will Take Charge wins the Clark, he has champion three-year-old male locked-up. However, should Will Take Charge run, and lose (in the Clark), Goldencents could make the decision much more difficult for Eclipse voters by defeating Groupie Doll in the Cigar Mile. Will Take Charge is 10-4-2-0 in 2013, with earnings of $2,633,320. His wins came in the Smarty Jones Stakes, Grade 2 Rebel, Grade 1 Travers and Grade 2 Pennsylvania Derby. In his two races facing older horses, he ran second in both the Grade 1 Jockey Club Gold Cup and Grade 1 Breeders’ Cup Classic. 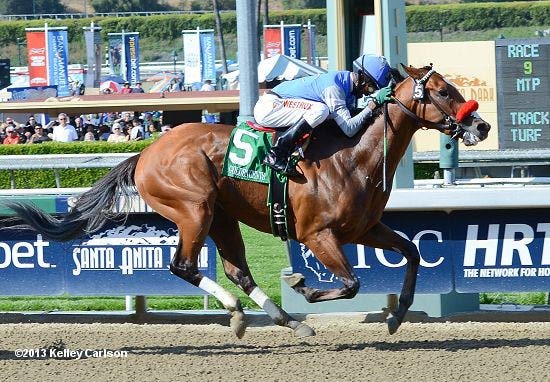 Goldencents is 9-3-3-0 on the year, and has earnings of $1,268,000. His wins came in the Grade 3 Sham, the Grade 1 Santa Anita Derby and most recently against older horses in the Grade 1 Breeders’ Cup Dirt Mile. He finished second in three races; the Grade 1 Bing Crosby Stakes, the Grade 2 Pat O’Brien Stakes and the Grade 1 Santa Anita Sprint Championship, all too against older horses. Assuming it is Will Take Charge or Goldencents, it will be the first time since 2000 that a horse has won Champion Three-year-old male without having won a Triple Crown race in their three-year-old campaign. 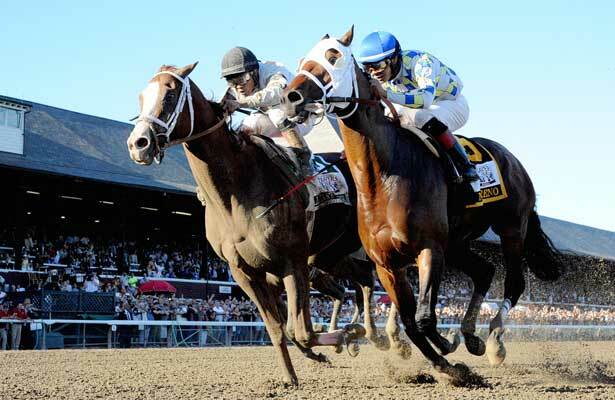 Tiznow secured his bid for 2000 Champion Three-year-old male with a win in the 2000 Breeders’ Cup Classic. 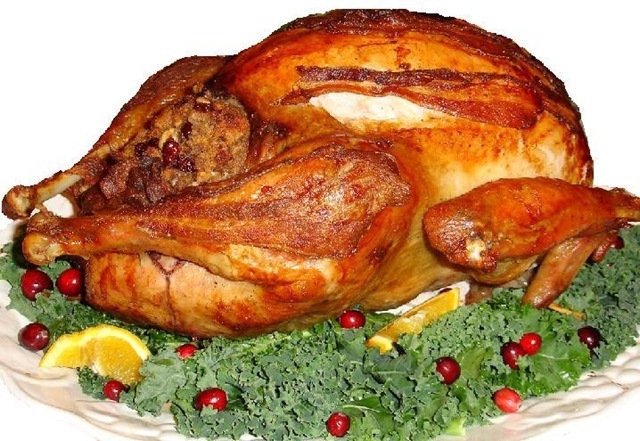 Hope you’re as hungry for Thanksgiving weekend as I am. Giddy up.